Rough and inhospitable, extremely hot or cold, fire or explosion hazard. Robots for routine and ad hoc safety checks in unmanned systems are used wherever people are reluctant to be present. ExRobotics B.V. in Halsteren, the Netherlands, is a leading expert in this field. Its products replace the sight, hearing, smell, touch, and hands of users. The Dutch manufacturer relies on image processing with industrial cameras from IDS Imaging Development Systems GmbH. In certain industrial areas, working under extreme conditions is essential. Robots are increasingly being used to minimize the risk for employees. Based on the experience of many years of cooperation with a multinational oil and gas group, ExRobotics has developed a series of robots especially for the inspection and monitoring of hazardous areas. The main target market is unmanned oil and gas facilities in harsh climatic zones or with a particularly high risk potential, but also markets such as the nuclear, mining, energy and chemical industries. The company attaches great importance to ensuring that all robots are IECEX Zone 1 or ATEX-certified at component level and thus comply with international or European directives for explosion protection. Thus, ExRobotics can produce modular systems faster without having to create a new certificate for every possible configuration. The basic idea is as simple as it is ingenious: The devices communicate with an operator in a secure control room via a wireless network. Human operators do not have to enter the danger zone. In addition, travel time and costs are eliminated. Whether on land or at sea, the control of several robots at different locations at the same time is just easily possible. And this from a distance of several hundred or even thousand kilometers. “We have shown that we can operate the robot over a distance of 9,500 km,” said Samir El Awadi, commercial director at ExRobotics, referring to a recent test. A robot at the ExRobotics plant in the Netherlands was controlled from the other side of the world, from Rio de Janeiro, Brazil. This is a crucial point, as a broad reach is essential for the main players in the oil and gas industry in the Middle East, North America and the Far East. The robots of the first generation — ExR-1 — operate purely by remote control. This means that they always need an operator to control and guide them. The further-developed ‘big brother,’ the ExR-1.1, is therefore already designed for the independent performance of routine security checks. The user has the choice of operating the robot directly from a distance, typically via the public 4G network, or allowing it to operate autonomously. In this case, the operator reacts only to warning messages and can check the monitoring information later if necessary. ExR-1.1 is also engineered for self-coupling and self-charging, with a maximum of 2 maintenance intervals per year. Different sensors of the robot serve as eyes and ears of the operator. It is fitted with a microphone for sound monitoring. In addition, there are three uEye cameras on board: a USB 3.0 UI-3591LE-C-HQ with 18 megapixel sensor for forward viewing, zoom, and inspection, and two USB 2.0 UI-1461LE-C-HQ cameras with 3.1 megapixels for navigation. The robot automatically navigates between the inspection locations and contacts the operator when it is on site and ready for inspection. White lines and other signal signs, such as beacons, are used as orientation aids. The UI-3591LE camera from IDS. The USB 3.0 model UI-3591LE-C-HQ offers a very high resolution with its 18 megapixel CMOS color sensor from ON Semiconductor. The extremely light-sensitive single-board camera captures the smallest details and is particularly suitable for shots with variable object distances and changing light conditions — ideal for the purposes of ExRobotics. Thanks to its minimal size, the cost-effective and versatile project camera offers an easy, space-saving integration. Also, the USB 2.0 UI-1461LE-C-HQ with its very light-sensitive CMOS sensor also from ON Semiconductor meets all requirements. The ½” large-format sensor with a resolution of 2048 x 1536 pixels renders extremely low noise performance with extraordinary color accuracy. The cost-effective, compact board-level camera offers 2 GPIOs, trigger and flash as well as an I²C bus for triggering external devices. ExRobotics used the uEye API — part of the comprehensive IDS Software Development Kit (SDK) — to integrate the cameras into its system. The SDK or IDS Software Suite for Windows and Linux (32- and 64-bit) is included and identical for all models, no matter if with USB 3.1 Gen 1, USB 3.0, USB 2.0 or GigE connection. On top of that, ExRobotics has developed its own specific software with which the images of the robot can be processed. This includes some very user-friendly zoom and snap functions. These are important and necessary for monitoring and for detailed images during inspection. These robots of the first batch can operate in a temperature range of -20 to +50 degrees Celsius. With minor modifications a range of -40C to +60C is within reach. The focus in the area of functionality will shift towards more autonomy, cloud-based storage systems, and the use of more and more image processing coupled with artificial intelligence. The robots of the ExR series are therefore more than just tools; they become independent helpers in the service of safety. ExRobotics B.V. is a leading international company specialized in robotic solutions for potentially explosive facilities. 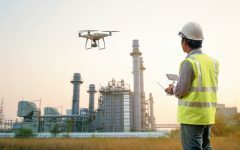 It produces Ex-certified robots (ATEX and IECEx Zone 1) that can remotely carry out otherwise potentially hazardous safety checks at remote facilities. IDS Inc. was founded in 2007 as a subsidiary of IDS Imaging Development Systems GmbH. Industrial camera manufacturer IDS Imaging Development Systems develops high-performance, easy-to-use USB, GigE and 3D cameras with a wide spectrum of sensors and variants. The almost unlimited range of applications covers multiple non-industrial and industrial sectors in the field of equipment, plant and mechanical engineering. In addition to the successful CMOS cameras, the company’s portfolio includes vision app-based sensors and cameras. The novel image-processing platform IDS NXT is freely programmable and extremely versatile. Since its foundation in 1997 as a two-man company, IDS has developed into an independent, ISO-certified family business with more than 250 employees. The headquarters in Obersulm, Germany, is both a development and production site. With branches in the U.S., Japan, South Korea, and U.K., as well as other offices, IDS is represented internationally.